... I got a certain little girl sheÕs on my mind No doubt about it she looks so fine ... Why 'Hush'? Because I love the song. - Russell Morris (1967) - Deep Purple (1968) and because it was written by Joe South. 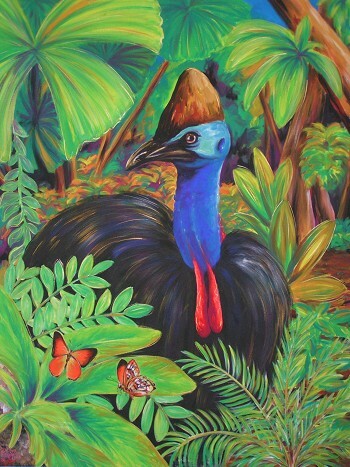 The Southern Cassowary (Casuarius casuarius) our magnificent rainforest gardener. He moves through the forest in measured steps like he owns it. And he does. He is responsible for the distribution of over 150 rainforest plants and trees. The cassowary needs the rainforest and the rainforest needs the cassowary. The Apollo Jewel butterfly (Hypochrysops apollo apollo) also has a close relationship with its surroundings. The butterfly lays its eggs on the bulbous ant-plant, the ant's take the larvae inside and look after it so they can get the sugary liquid secreted by the caterpillar. The butterfly needs the ants and the ants need the butterfly.